First of all, let me tell you a brief story behind this project. It was put together by Martina Mensikova, a nail artist. The motivation was to join a national contest in nail art CzechNailCup, which is being held twice a year since 2015, in Spring and in Autumn. Martina chose a category Poster, theme Sci-fi/Fantasy. The quality of work of the other contestants is usually very high so it takes a team effort to achieve a competitive result. Therefore Aneta joined the team as a make-up artist and I joined as a photographer. By the way, you can have a look at the other artworks and the results on the contest’s website. 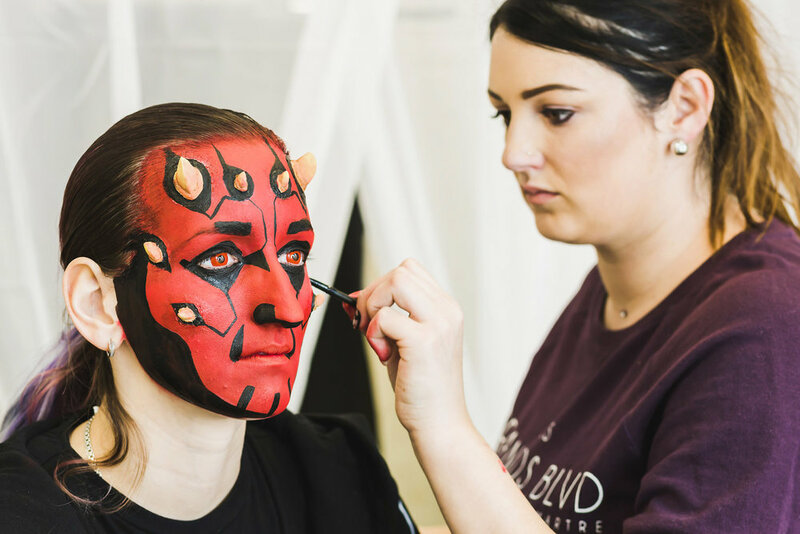 The goal was to transform our model Vera into Darth Maul, a Star Wars character, with an emphasis on the nails. The whole process of transformation was very interesting because I had no idea how much work had to be done in advance when it comes to nails like these. Did you know it takes up to 2 hours to create only 1 nail like this? So yes, it took about 10 hours of patient work to do the whole hand. On the day of the shoot we just focused on makeup and styling, as you can see in the photos above. Now, enjoy the final photo and I will tell you some thoughts behind it. As I said, we were creating a poster for a nail art contest. The photo had to be interesting as a whole to catch attention of the judges, however, the nails had priority. Therefore they are the brightest part of the photo, each one of them carefully positioned. In order to create a darksome mood we started shooting on a completely black background. Soon we realised that the body shape was lost, as we were shooting black on black, so I suggested to add a bit of red light from behind. Not only it defined the contour greatly, it added an infernal feel to the photo as well. Although we had so much fun during the project, do you know what was the most hilarious part? Due to time constraint, because it all took longer than we expected, Vera didn’t have time to wash her face after we wrapped it up and she was forced to go home like that, using a public transport! Definitely a moment to remember for everyone, don’t you think?